The brain tumour treatment team consists of highly experienced doctors, and other health care professionals who care for more than 600 adults and children with gliomas and other brain and nervous system tumours each year. Specialists from neurology, neurosurgery, radiology, neuropathology, radiation therapy, clinical oncology, psychology and brain rehabilitation work together to deliver the most appropriate treatment for each patient diagnosed with a tumour. Bristol Neuro-Oncology services treat a population of over 3 million adults and 5 million children. The most common method of referral is from a secondary care centre to the Neurosurgical unit at Southmead Hospital Bristol, which is part of the North Bristol NHS Trust. Referrals are accepted from anywhere within the country. Surgery is carried out at North Bristol NHS Trust with further treatment such as radiotherapy or chemotherapy, if required, will take place at the nearest local hospital. Making a referral has now been streamlined into a single step electronic process. Referrals can be made through the Bristol Neuro-Oncology website to refer a patient to the weekly Neuro-Oncology MDT. Emergency Referrals are made over the telephone. Contact the on-call neurosurgical team at Southmead Hospital 0117 950 5050, bleep 1748. 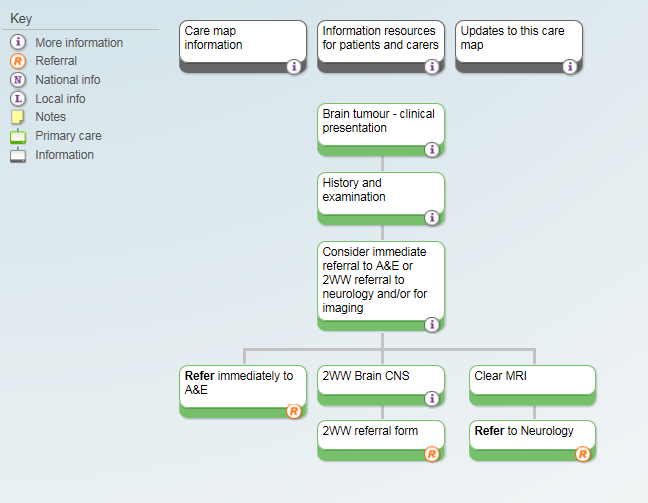 Alternatively referrals can be made through e-Referral using the Brain & CNS Referral Form (word doc). Please see link to NICE Guidelines Brain and CNS Cancers . Stupp R, Tonn JC, Brada M et al. High-grade malignant glioma: ESMO Clinical Practice Guidelines for diagnosis, treatment and follow-up. Ann Oncol 2011; 21 Suppl 5: v190-v193. National Institute for Health and Clinical Excellence (NICE). Referral guidelines for suspected cancer: CG27. London: NICE; 2005. Department of Health (DH). Direct access to diagnostic tests for cancer: best practice referral pathways for general practitioners. London: DH; 2012. National Comprehensive Cancer Network (NCCN). Central nervous system cancers. Version 2.2013. Fort Washington, PA: NCCN; 2013. Driver and Vehicle Licensing Agency (DVLA). At a glance guide to the current medical standards of fitness to drive. Swansea: DVLA; 2013. Clinical Knowledge Summaries (CKS). Brain tumour - suspected. Newcastle upon Tyne: CKS; 2012. Patil CG, Pricola K, Sarmiento JM et al. Whole brain radiation therapy (WBRT) alone versus WBRT and radiosurgery for the treatment of brain metastases. Cochrane Database Syst Rev 2012; 9: CD006121. Symptoms of a brain tumour are determined by its location and size . The aim is to ensure that patients with suspected brain tumours have early access to imaging . GPs may wish to refer these patients directly for MRI brain, if rapid access to scanning is available, in addition to specialist referral – this would reduce the time taken to achieve a diagnosis as results would be available by the time the patient sees the specialist [6,7]. Patients with a history of cancer and any of the above symptoms should be referred back to their original treating team as a priority, as this is suggestive of metastatic disease . Patients presenting with drowsiness, vomiting, or seizures may need immediate referral to A&E . NB: Incidental abnormalities can be found on MRI in up to 10% of scans – patients should be counselled for this as it can cause considerable anxiety and have implications for life insurance or mortgage policies [3,7]. Only 1% of patients are diagnosed following an urgent GP referral for suspected cancer, with 58% of brain tumours being diagnosed via an emergency presentation .